Heads up, people! The 2012 edition of Apple's Worldwide Developer Conference—one of the company's biggest yearly events—has been announced: June 11 to June 15 in San Francisco. Traditionally, big new stuff always appears at the WWDC, sometimes hardware, sometimes software. What will happen in this keynote, the first by Apple's CEO Tim Cook? My bet is the next-generation MacBook Pro 2012. In the last WWDC, Steve Jobs presented OS X Lion, iOS 5 and iCloud. The three were very important updates. Lion started to morph into iOS. iOS got new important features. And more importantly, iCloud tied together both the Mac and the iOS devices over the Internet, a fundamental shift in Apple's thinking. In 2012 there will be software updates too, but they will not be huge. We already know about OS X Mountain Lion. We will see an update on that. As for iOS, it is still too early to tell if we are going to get a peek at iOS 6. Most likely, there will be a minor iOS update, which will be released with the iPhone 5 later in the summer. By the way, if you are expecting iPhone 5, you may get disappointed. The latest rumors claim it will come at the end of summer or the fall. The iPhone 3GS, however, was announced at WWDC 2009, and the iPhone 4 was announced at WWDC 2010. The iPhone 4S had its own special event on October 4, 2011, at the "Let's Talk iPhone" event. 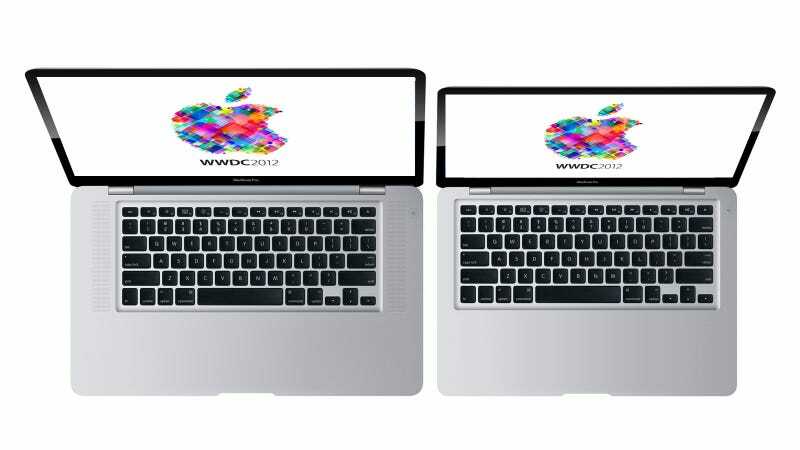 But WWDC 2012 will be a perfect opportunity to showcase Apple's next-generation MacBook Pros. Not only is it a favorite product for developers, but it's one of Apple's stars for consumers and professionals. There's precedent for similar hardware product introductions. Apple announced the unibody MacBook 13-inch in WWDC 2009, after introducing 15 and 17-inch models in October 2008. Apple touted the unibody MacBook as the most advanced notebook in the planet, thanks to its unique aluminum manufacturing technique that has since been replicated by other manufacturers. In WWDC 2003 Steve Jobs introduced the iSight camera—with iChat AV—and the Power Mac G5. At WWDC 2004 the company introduced the Apple Cinema Displays. In 2006, the first product with an Intel processor—a huge but quiet revolution in the company—appeared: the Xeon-based Mac Pro. So yes, there has been plenty of consumer and pro hardware announced at WWDC. The next-gen MacBook Pro will be a big aesthetic and functional jump, too. In fact, it will be a more major advance than even the unibody was. Expect a product very similar to the Air, which will probably get a spec bump. Another point in favor of this announcement is the release of Intel's Ivy Bridge, which happened this last Monday. Ivy Bridge will be the heart of Apple's new notebooks. It will be crucial to achieve their sleek profile while maintaining battery life. And the final clue: the MacBook Pro distribution channel is drying up. Apple starts to limit the supply of products so it can clean all the stock before the release of a new versions. So yes, all the stars and planets are aligned. If there is no surprise announcement between now and June 11, WWDC 2012 may again be the developer conference of the MacBook Pro.